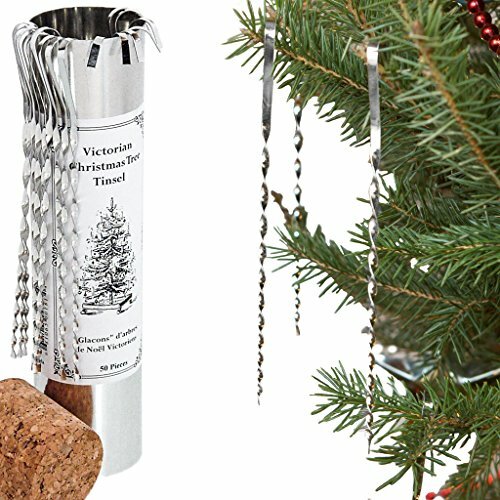 Pietersma Tinworks Victorian Christmas Tree Tinsel - Handmade Tin Icicles Ornaments in Canada by Pietersma Tinworks at Two Clock. MPN: 00181. Hurry! Limited time offer. Offer valid only while supplies last. Once, tin tinsel adorned the Christmas trees of our grandparents and great-grandparents. This timeless decoration adds a finishing touch to any tree. Once, tin tinsel adorned the Christmas trees of our grandparents and great-grandparents. This timeless decoration adds a finishing touch to any tree. Packed in sturdy tin containers for storage, each tube contains 50- five and half inch silvery pieces. Our Premium Tinsel is carefully made so that all pieces are straight and have an even twist. Ships easily. Packaged in handmade tin cans and closed with a natural cork. Makes a great hostess gift, teacher gift or gift for office parties. Each piece of tinsel is carefully made to be straight and have an even twist. We make tinsel in 3 stlyes. Victorian, Jewelled and Tinsicles. This timeless decoration adds a finishing touch to any tree. The multiple twists on each piece will add sparkle to your tree. Packed in sturdy tin containers for storage, each tube contains 50- five and half inch silvery pieces. If you have any questions about this product by Pietersma Tinworks, contact us by completing and submitting the form below. If you are looking for a specif part number, please include it with your message.